Our family has actually owned at least one version of each generation of MDX to date. The MDX has always been the luxury workhorse in the family, providing ample space to haul boxes of documents for work, or seven people and their luggage for vacation. 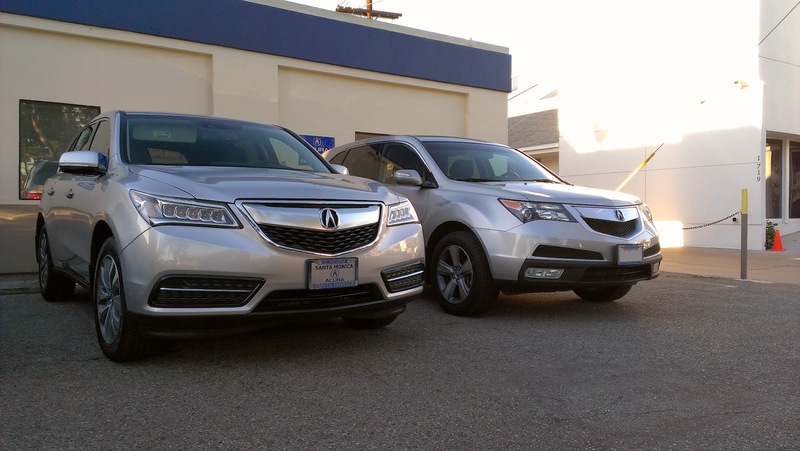 Each successive MDX our family has owned has gotten bigger, but it has also gotten better in some way. The 2014 MDX that we picked up on the same day we picked up our 2014 RLX is better than the 2011 MDX we previously owned in virtually every way, except for the fact that this is the first MDX we have owned that does not have AWD. Wanting to find out if the new MDX could still hustle as quickly as the old one, even without SH-AWD, we took the car out on the Palos Verdes Peninsula to thrash on it a bit. Here, there are some great twisty roads that run right along the coast, offering not only a fun place to drive, but spectacular views of the Pacific Ocean and Catalina Island. With the MDX's new Integrated Dynamics System (IDS) and transmission set to sport, we made our way up and over the hills to plunge down towards the water, me in the MDX and East Brother following in my S2000 with GoPros attached. Despite being front-wheel drive, the new 2014 MDX still hustles reasonably well. With the IDS in sport, the steering and throttle feel much more responsive than they did in any of the previous MDX models we owned. The problem is what happens when you approach a corner in the MDX. Being a nose heavy, front-wheel drive crossover, you can definitely feel the car push while trying to get through a corner quickly. You can also definitely feel the weight of the car as you guide the car through a corner. It is a bit nerve wracking, but definitely not unmanageable. Obviously, some of these problems would have been easily remedied had we gotten the SH-AWD version of the new MDX, but living in Southern California, and never likely to see off-road action, we really could not justify spending the extra money on an AWD system we would hardly ever use. Aside from the issues of being a heavy, the rest of the car is quite good. The direct-injected 3.5 liter "Earth Dreams" V6, despite being smaller and less powerful than the outgoing model's 3.7 liter V6, manages to be faster to 60 mph than the second generation MDX. The fact that it gets better gas mileage, along with faster acceleration, is thanks to a major diet that allowed the current MDX to shed over 500 lbs compared to its predecessor. And despite this hefty weight loss, the interior dimensions have grown in most directions from the previous one. How much more space? Enough to allow the MDX to currently hold the (somewhat dubious) honor of having the most third row passenger space in its class. Still though, you really would not want to let a full grown adult sit in the third row for more than a short drive. The 2014 MDX also gets some new goodies from the 2014 RLX, such as Acura's "Jewel Eye" LED headlamps, and the two tier, touch screen infotainment system. If there is one major complaint I have with the MDX's touch screen system though, it is why Acura decided to bury the seat warmer function into the touch screen instead of leaving it as a button like on the RLX. Though you rarely need the seat warmers in Southern California, what if you live in an area where the winters are obscenely cold? In order to turn on the seat warmers, you would have to remove your gloves and dig through the touch screen menus while your hand freezes off. Hopefully Acura will address this problem at some point. So far, the 2014 MDX has proven to be a superior vehicle compared to all the previous version of the MDX our family has owned. While being front-wheel drive does have its disadvantages, primarily in the agility of this two-ton people carrier, there really is no reason to get the SH-AWD version in Southern California if you never take the vehicle off road or hustle it through the mountains. Plus, being front-wheel drive means improved fuel economy and less mechanical complexity. As we spend more time with the MDX, we will continue to update our thoughts on this latest addition to our long-term fleet.